Hello again, stamping friend! I’ve finally carved out some time to participate in the latest Watercooler challenge – phew! I really enjoy taking part in challenges; I find that they really do inspire me to not just get creating if I’m in a slump, but they also give me new ideas for layouts or colour combinations, or they give me a prod to try a new technique or fancy fold. 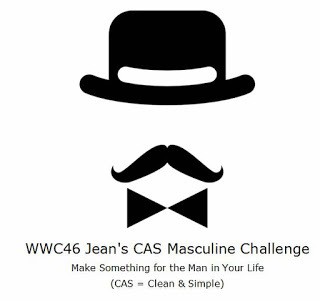 This week’s challenge with the Watercooler is a CAS Masculine card challenge – CAS meaning Clean And Simple. This challenge was created my ingenious friend Jean Fitch– she always has great ideas, and is so generous in sharing them! Believe me – it’s more difficult for me than you would think! I mean – Clean and Simple – should mean a minimalistic approach; less work, right? Well – there’s nothing like trying to produce a minimal card to find out how much you actually like to put onto a card front! LOL Trust me, it took me more than 1 try to come up with a card that I thought *might* qualify as CAS – what do you think? I punched the ‘records’ out of Basic Black cardstock using the 1 3/4″ Circle Punch, then used the 3/4″ Circle Punch for the inner label, punching them from Real Red and Daffodil Delight cardstock. I used my Paper Piercing Tool to make the holes in the middles, then attached them to the front using Stampin’ Dimensionals. The sentiment was stamped in Tempting Turquoise onto Whisper White cardstock, then that was layered on top of a piece of Tempting Turquoise cardstock. Before attaching them, I used my 1″ Circle Punch to snip off each corner, to give it a ticket look. And then yes, I just couldn’t handle the blank corners, so I added some of the Metallic Sequins! So there my CAS Masculine card! If you haven’t already, you should check out the Watercooler challenge page, and submit your own card for this challenge! If you win, you get a nifty badge to put on your blog! Next Next post: My “Clean & Simple” Fail! Hi Deb. Clean and simple takes a lot of practice. It’s hard to “walk away” while there is space to fill. I have that stamp set, too, and don’t use it often enough. I wish it would have been included in the catalogue because I think it would be popular if more people knew about it. Love those records and the “spin” you gave the card. This could definitely be for the man in your life but could work for almost anyone—gender neutral. Thanks so much for joining our Watercooler Wednesday Challenge this week. I love your little records! 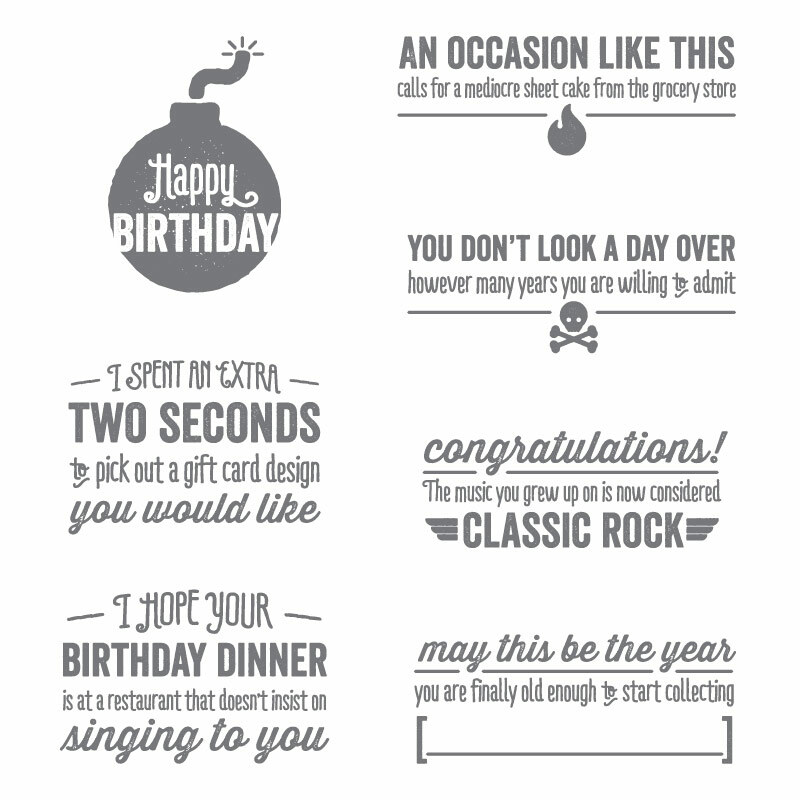 That is the cutest idea and such a fun card! 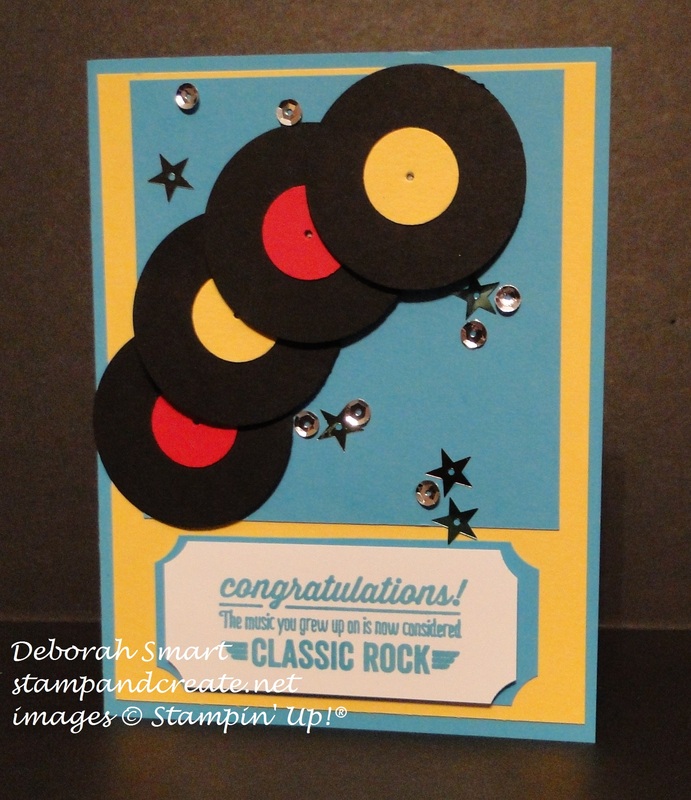 Deb, love this card. It is the quintessential guy card (or at least guys old enough to remember vinyl). Thanks so much for joining the watercooler! Yeah – even I’m of the age to remember vinyl! Actually, our eldest son (20 yrs) loves listening to vinyl recordings – the sound is much better!